Black cats have long had it rough. From the Middle Ages in Europe to the Salem witch trials, black cats have been associated with witchcraft, evil, or just plain old bad luck. Even today, black cats are among the last to be adopted at shelters across the US. Now, reports from the UK of an even more ridiculous reason not to adopt these gorgeous and loving cats. According to the RSCPA, the trend of people taking “selfie” pictures of themselves with their pets has resulted in people surrendering their black cats by the hundreds. The reason? The inky felines aren’t photogenic enough. Even though in the UK black cats are actually associated with good luck, this hasn’t been enough to overcome the challenges black cats face. According to the RSPCA, around 70% of the reported 1,000 cats currently in UK shelters are black, or black and white. 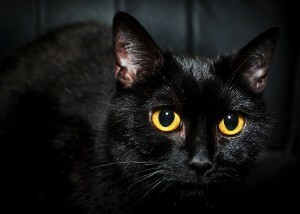 The increase in the number of black cats being abandoned is attributed, at least in part, due to their dark fur being perceived as less attractive in photographs and selfies. Adopters are looking for more colorful felines, with ginger cats heading the popularity list. Look for a simple, uncluttered background to help your cat stand out. You obviously don’t want to use a dark background that your black cat will disappear in, but also avoid very light backgrounds as the extreme contrast may be too much for your camera’s sensor to handle. Solid jewel tones or pastels often show off black cats to good advantage. The right lighting is the most important aspect; if possible, use lots of soft, natural light and avoid harsh lighting and direct flash. If you must use flash, try bouncing your on-camera flash off a ceiling, wall or a white surface, or use off-camera flash to prevent a harsh glare off your cat’s fur or the dreaded “laser eyes” look. Also, watch out for back lighting or you’ll end up with nothing but a black silhouette. Take several test shots to help you get the camera settings correct. Digital photos are free, so don’t be afraid to take lots of pictures to get that one great shot. Be patient, and have your camera within reach so you’re ready when your cat is doing something particularly cute, and remember to keep the focus on your black cat’s stunning eyes.